The Cultural Services of the French Embassy and the Institut Français have announced a partnership with EXPO CHICAGO (the International Exposition of Contemporary and Modern Art) for a year-long curatorial and cultural exchange program between France and the United States. The program will seek to foster relationships between curators, artists and institutions in both Paris and Chicago. Representing France in Chicago, Guillaume Désanges, independent curator and art critic and Matthieu Poirier, independent art historian, critic and curator, will attend EXPO CHICAGO/2014 to meet with a number of the city’s most respected museums, institutions and art organizations. Their presence in Chicago will mark the first of many exchanges and relationships to form between Chicago-based gallery directors, both institutional and independent curators, collectors and artists. Representing Chicago in France, Naomi Beckwith, Marilyn and Larry Fields Curator at the Museum of Contemporary Art Chicago, and Megha Ralapati, Residency and Special Projects Manager at the Hyde Park Art Center, will travel to Paris from October 16–25 to attend the Focus Visual Arts Program (FIAC and the Rennes Biennal) at the invitation of the Institut français in Paris in collaboration with the Cultural Services of the French Embassy. Through direct access into the French art scene, their curatorial insight and feedback will help develop extended collaborations and future artist residency projects in the Central US, in partnership with the Institut français in Paris. The collaboration will officially begin with a conversation between Guillaume Désanges, Matthieu Poirier, and Naomi Beckwith on September 19 as part of the EXPO/Dialogues program. The panel will be introduced by Vincent Floreani, Consul General of France in Chicago. Presented in partnership with The School of The Art Institute of Chicago (SAIC), EXPO /Dialogues offers panel discussions, conversations and provocative artistic discourse with leading artists, curators, designers and arts professionals on the current issues that engage them. As part of the /Dialogues 2014 program, Guillaume Désanges and Matthieu Poirier will be in conversation with Naomi Beckwith on Friday, September 19, 5:30 pm. The talk will be introduced by Consul General of France in Chicago Vincent Floreani and will be moderated by Founder of Contemporary Art Daily Forrest Nash. Naomi Beckwith is the Marilyn and Larry Fields Curator at the Museum of Contemporary Art (MCA) Chicago. Since she joined the MCA in 2011, she has organized the highly acclaimed exhibitions: MCA Plaza Project: Yinka Shonibare, MBE (2014), MCA Screen: Leslie Hewitt in collaboration with Bradford Young (2014), William J. O’Brien (2013), Homebodies (2013), Jimmy Robert: Vis-à-vis (2012), and Color Bind: The MCA Collection in Black and White (2012). Beckwith’s upcoming projects in 2015 include the group exhibition The Freedom Principle, co-curated with Dieter Roelstraete. Prior to the MCA, Beckwith was Associate Curator at The Studio Museum in Harlem and held multiple fellowships, including the Whitney Museum Independent Studies Program and at the Institute of Contemporary Art in Philadelphia. Guillaume Désanges is an independent curator and art critic. He is the Founder of Work Method, a Paris-based agency for curatorial projects. Désanges coordinated the artistic projects of Laboratoire d’Aubervilliers from 2001–2007. Recent projects include: Concrete Erudition (2009-2011, Le Plateau-Frac Ile-de France, Paris); Wander (2011, Centre Pompidou Metz); Amazing ! Clever! Linguistic! An Adventure in Conceptual Art (2013, Generali Foundation, Vienna); A Universal Exhibition, documentary section (Louvain-la-Neuve biennale, Belgium, 2013), Curated session: the Dora Garcia files (Perez Art Museum, Miami, 2014). Désanges is currently the curator at La Verrière (Fondation Hermès, Brussels), where he is organizing a series of exhibitions entitled Gesture of the Mind, and also teaches at Université Paris-Sorbonne. Matthieu Poirier is an independent art historian, critic, and curator. He received his doctorate in contemporary art history from the Université Paris-Sorbonne (Paris IV). Former Fellow at the German Center in Art History in Paris, he taught at the Université Paris-Sorbonne, l’École Régionale des Beaux Arts in Rouen, and l’École Européenne Supérieure de l’Image in Angoulème. He was the curator with Serge Lemoine of the major exhibition Dynamo. Un siècle de lumière et de mouvement. 1913-2013 (Galeries Nationales du Grand Palais), a Scientific Adviser for the retrospective Julio Le Parc (Palais de Tokyo) and has organized the exhibitions Post-Op. Perceptual Gone Painterly. 1958-2014 (Galerie Perrotin, Paris), Spectres (Roesler Hotel, Sao Paulo), Landscope I and II (Galerie Thaddaeus Ropac, Paris and Salzburg), Le Monochrome Sous Tension (Tornabuoni Art, Paris) and Julio Le Parc: l’Œil du Cyclopse (Bugada & Cargnel, Paris). He has also contributed to art books Bewegung / Mouvement (Deutsches Forum für Kunstgeschichte), Nachbilder (Diaphanes Verlag, Munich), L'art moderne et contemporain (Flammarion) as well as exhibition catalogs “François Morellet (Musée national d’art moderne), "Immersion" (Musée de Valence), “Chefs-d'oeuvre?" (Centre Pompidou-Metz), and the magazine Der Spiegel and the daily Le quotidien de l’art. Megha Ralapati manages the Jackman Goldwasser Residency at Hyde Park Art Center, a new initiative that brings international and regional artists to Chicago to deepen engagement between local and global art practice. Since 2012, Ralapati has organized residencies with Deniz Gül (Istanbul), Minouk Lim (Seoul), Einat Amir (Tel Aviv), Jen Delos Reyes (Portland), Paul Mpagi Sepuya (New York, Los Angeles) and Sanjeev Shankar (New Delhi), among others. Upcoming residencies include Jonathas de Andrade (Recife) and Vagabond Reviews (Dublin). Ralapati has developed independent projects including A Perfect Human at Dorsch Gallery in Miami (2009), Double-Jointed at Scaramouche gallery in New York (2012), and contributed to New Narratives: Contemporary Art from India at the Chicago Cultural Center (2007). She is a contributing editor at ArtAsiaPacific and recent writing has been included in publications, including Black Sun (2014 Devi Art Foundation) and Manual for Treason (2011 Sharjah Art Foundation). 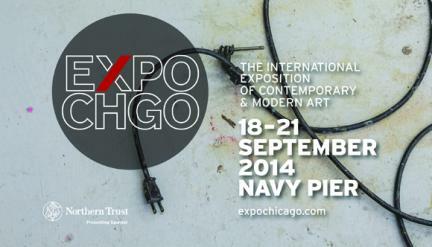 EXPO CHICAGO/2014, The International Exposition of Contemporary and Modern Art, is presented by Art Expositions, LLC. Now in its third year as a leading international art fair, EXPO CHICAGO (Sept. 18 – 21, 2014) is a four-day art event featuring 140 leading international galleries and offering diverse programming including /Dialogues, IN/SITU and EXPO VIDEO. Under the leadership of President and Director Tony Karman, EXPO CHICAGO draws upon the city’s rich history as a vibrant destination for arts and culture, helping to define the contemporary art community in Chicago while inspiring the city’s collector base. Vernissage, the opening night preview benefiting the Museum of Contemporary Art Chicago, takes place Thursday, Sept 18, 6 – 9 p.m. Northern Trust in the Presenting Sponsor and United Airlines is the official airline for EXPO CHICAGO.